The internet has many obsessions. Cats. Calling fictional creatures “thicc.” Repurposing this clip of FRIENDS where Joey, Chandler, and Ross all dance out of the room eating pizza. But frequently in internet culture we praise celebrities that are a “good hang.” It’s a conversation that’s rooted in idol worship and star fuckery, but that doesn’t mean it’s not a fun conversation to have. In finding someone that’s probably actually a “good hang,” however, what we’re really saying is that we appreciate someone’s cavalier, no-fucks-given attitude to their own celebrity status. Chrissy Teigen. Jennifer Lawrence. Rihanna. These women ostensibly win the internet because they don’t mind bringing a flask to the Grammys, or fawning over interviewing Kim Kardashian. So hear me out: Katie Nolan deserves to be thrown into that “good hang” conversation. As a media personality, Nolan embodies that cavalier, no-fucks-given attitude we applaud, and while she may appear (somewhat) polished and TV ready on ESPN, her hilarious, unhinged, and high-spirited personality is on full display behind the mic of her podcast. 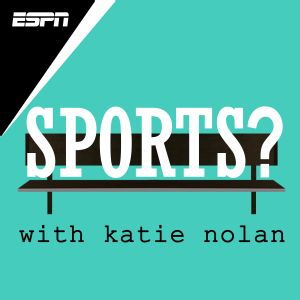 Just as the question mark that concludes its title implies, SPORTS?, which Nolan started after she moved from FOX Sports to The Worldwide Leader, is confused as to whether or not it’s actually a sports podcast, and it’s all the better for it. To be clear: it IS a sports podcast, albeit one that is caustic and a bit liberal regarding the subject matter. Have you ever debated amongst your friends who would win a football game, not based on the strength of the athletes or the strategy of the coaches, but instead based on who would win if their mascots actually duked it out? Don’t worry, SPORTS? has you covered. Have you ever had an NCAA bracket ruined by those pesky round one upsets? Well, no one really cares about your NCAA bracket and that includes Nolan, but SPORTS? devoted an entire episode to doing a bracket of things that are upsetting nonetheless (“Long Emails” vs. “The Way That Chalk Feels On Your Hands” is such a Sophie’s choice for me). Drafts of the best potential celebrity all-star game lineups, which Marvel super heroes would win the Winter Olympics, and 10 minutes on facts about the Pope all make up the lifeblood of SPORTS?, and Nolan endearingly operates herself outside of the oftentimes rigid persona of sports talk radio. SPORTS? often times walks a thin line between caring about its subject material and simply being aware of how silly it is to actually care about sports—and it’s a refreshing line to walk. Her two producers/co-hosts have no issues indulging in Nolan’s ridiculousness. Ashley Braband, Philadelphia sports enthusiast and generous laugher, and Daniel Dopp, co-host of ESPN’s THE FANTASY SHOW, both actively buy into the shenanigans and act as either complementary accomplices or tongue-in-cheek adversaries to the show’s sometimes unwieldy discussions. Their talk triangle works wonderfully, with none of the hosts taking either the actual sports talk or the fringe culture discussions seriously enough to bog down the conversation, but taking both seriously enough to make them propel forward—there are no 30-minute discussions about offensive line play or analysis of Tiger’s new swing, only genuine deep-dives into the history of athletes injuring themselves during celebrations or discussing the best ‘90s one-hit-wonders. Nolan’s wit and charm make her an ideal podcast host. Her timing and pop culture knowledge elevate SPORTS? past the average sports podcast without ever pushing its fun into grossly miscalculated Barstool Sports territory. Through everything she does, Nolan’s revealed herself to be a good hang, and more and more I hope the culture (and ESPN) take notice of that and elevate her to deserved heights. For now, SPORTS? remains the truest and most enjoyable use of her varied, Swiss Army knife-like talent.